China currently controls production but the country only has 37 percent of the world’s estimated reserves. 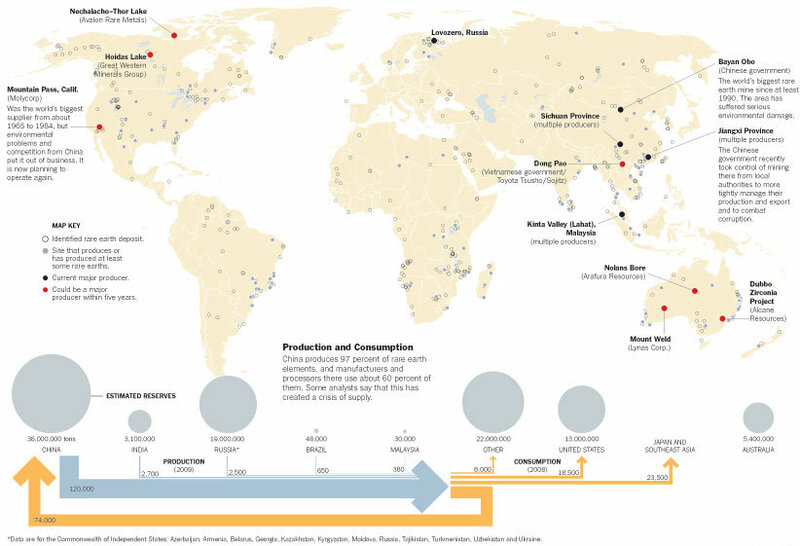 This second visual published by the NY Times shows the identified rare earth metal deposits around the globe. The U.S. used to be a top manufacturer of rare earth metals back in the 1960s, but eight years ago environmental infractions shut down the Mountain Pass, California mine, the largest deposit of rare earth metals outside of China. Currently, there are efforts to restart production at the mine but several hurdles must be cleared first. Today, the U.S. imports 87 percent of its rare earths from China. Other countries such as Kenya, South Africa, Malawi and Greenland are believed to be sitting atop large deposits of rare earth metals as well. Increased production outside of China is required in order to meet increased demand. 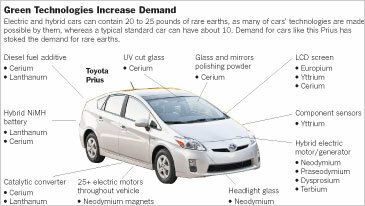 Estimates show that global demand is expected to reach 205,000 tons by 2015, according to the Guardian. As high tech becomes a greater part of people’s lives in both the developing and emerging world, the importance of these metals should continue to rise. A table listing the seventeen rare earth elements, their atomic number and symbol, the etymology of their names, and their main usages (see also Lanthanide#Technological_applications) is provided here. Some of the rare earths are named for the scientists who discovered or elucidated their elemental properties, and for their geographical discovery. 39 Y Yttrium for the village of Ytterby, Sweden, where the first rare earth ore was discovered. Yttrium-aluminum garnet (YAG) laser, YBCO high-temperature superconductors, yttrium iron garnet (YIG) microwave filters. 59 Pr Praseodymium from the Greek “prasios”, meaning leek-green, and “didymos”, meaning twin. Rare-earth magnets, lasers, core material for carbon arc lighting, colourant in glasses and enamels, additive in Didymium glass used in welding goggles, ferrocerium firesteel (flint) products.